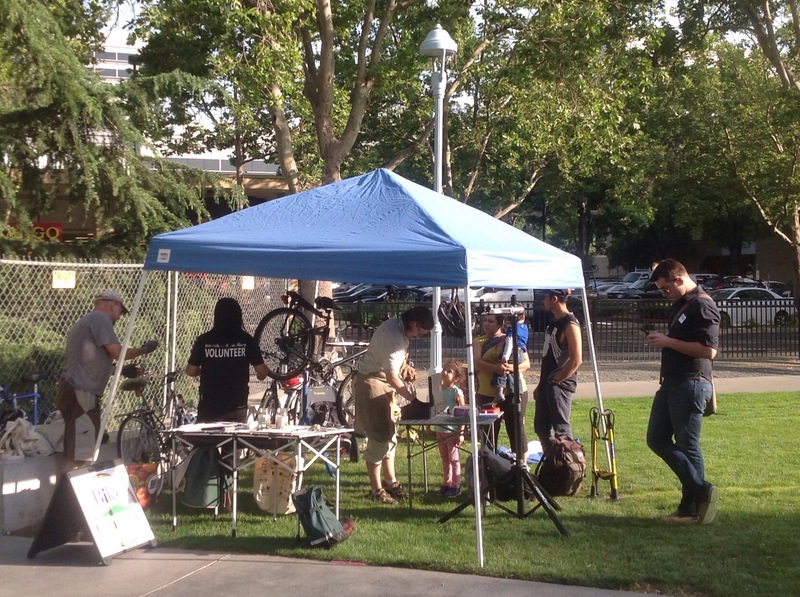 Bike Concord started in 2014 with a community bicycle repair tent in Concord’s Todos Santos Plaza Farmers’ Market. While we have expanded into many other projects, the Bike Tent remains our focal point. The Thursday Farmers’ Market resumed for the 2015 season on April 23, and Bike Concord was back with an even stronger presence. We will be at the corner of Grant St and Willow Pass Rd from 5pm to dark every Thursday through October 22. 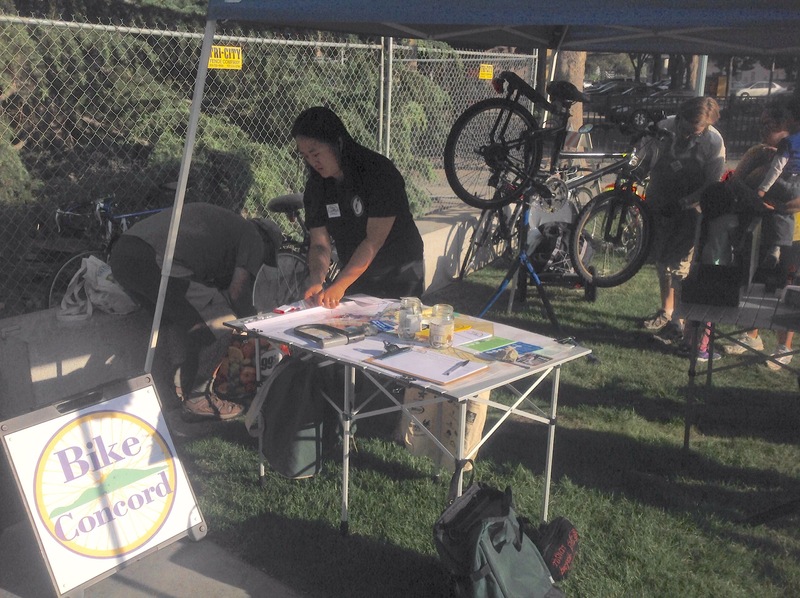 Come see us, sign our petition for a bike-friendly Concord, and grab a Bike Concord button! We’d love to tell you in person what we’ve been working on for safe, convenient bicycling in our community, and also to hear your ideas. We are always looking for more people to staff the Bike Tent, as well as get involved in other Bike Concord projects. If this could be you, please visit our projects spreadsheet at projects.bikeconcord.org and add your name wherever you want to help. Bike Concord organizers Smitty Ardrey, Janet Young, and Luke Casey, plus lead mechanic Bronwen Mauch. Bike Tent lead Janet Young arranges materials on the outreach table. View from the path. A banner will soon identify the Bike Tent to passers-by. 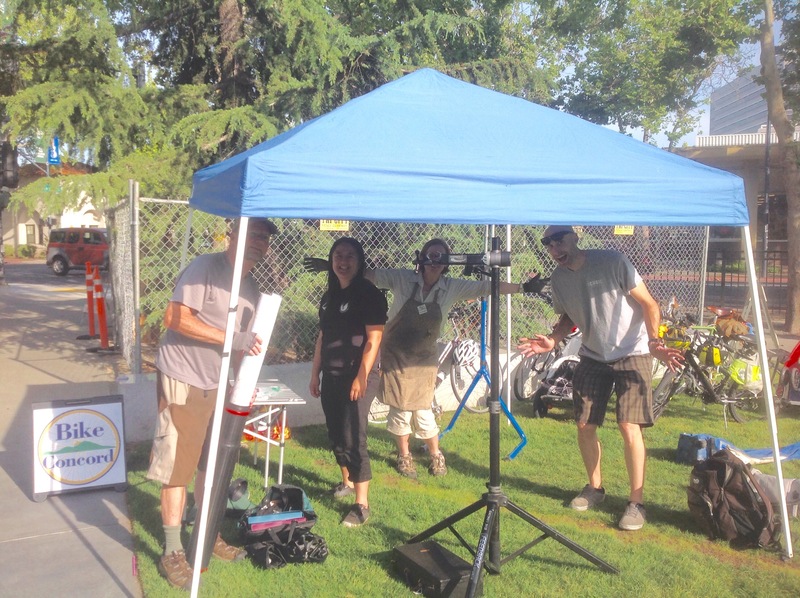 This year, we are happy to be able to employ a regular professional mechanic at the Bike Tent, thanks to a generous grant from John Muir Health. Her name is Bronwen Mauch. Although now a long-term Bay Arean, Bronwen is a native of New York City. She has worked in some renowned bike shops in Manhattan, and has taught literally thousands of people how to repair a flat tire as a full-time bike shop and bicycle riding instructor for eight years in Brooklyn’s I.S. 318 middle school. In the Bay Area, she has worked at Oakland’s industrial arts co-op, The Crucible. She is also an artist, creating a variety of beautiful objects from used bicycle parts. Bike Concord organizers, who are no strangers to the maintenance of their own bicycles, have already learned a lot from Bronwen’s practical expertise. Come get your bicycle tuned up by Bronwen at the Bike Tent and she will explain everything she does. 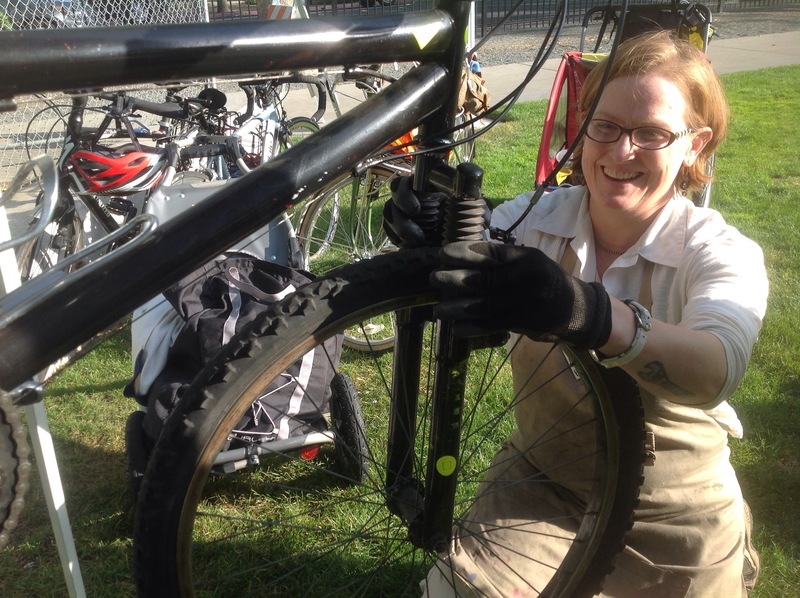 Bike Tent lead mechanic Bronwen Mauch extending the useful life of a hard-working bicycle. As Bike Concord’s mission is to make bicycling an attractive transportation choice in Concord, we consider it essential to demonstrate the viability of this choice by transporting not only ourselves but all the equipment for the Bike Tent on our bicycles. Thanks to a bicycle cargo trailer, this includes even the tent itself! 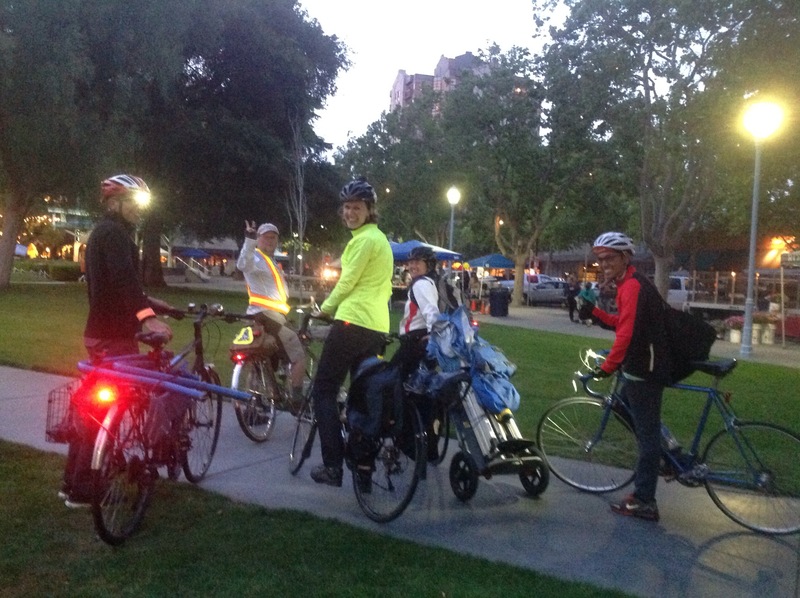 Bike Concord organizers Kenji Yamada, Smitty Ardrey, Laura Bergman, Janet Young, and Marlo Villanueva set off on their bicycles to carry all the Bike Tent equipment back to storage. Hi, I just found your blog about your weekly bike tent services. I just missed the last date. Do you happen to have another location for your bike repair services I can go to instead? Hi Julie, you haven’t missed the last date. It’s the day after tomorrow, Oct 27. Unfortunately we don’t have another location yet, but we are working to establish a nonprofit community bike shop where you’ll be able to learn to do your own bike maintenance, use tools, and receive expert help. We are holding our second annual fundraiser for that project on Saturday, Dec 3. Please watch this blog for updates! Meanwhile, Bike Tent will resume along with the Farmers’ Market next April. By the way, all our events are posted on our public Google calendar: calendar.bikeconcord.org.